The Acadia Commandery was formed in October 1974 with 14 founding members. It became readily apparent in its early days that the Commandery would face significant challenges due to the distributed geography of the Maritimes combined with a relatively small number of members. However, regardless of the said challenges, the Commandery was able to create several fruitful projects carried out during its first six years of its existence. It was originally named "Acadian Commandery" which was revised to "Acadia Commandery" in 1989, although, the name "Acadia Commandery" did appear in the minutes of the 1984 Chapter-General. The name "Acadia" can also be found in an early map from the 18th century known as the "Mitchell Map" of 1755 depicted left. 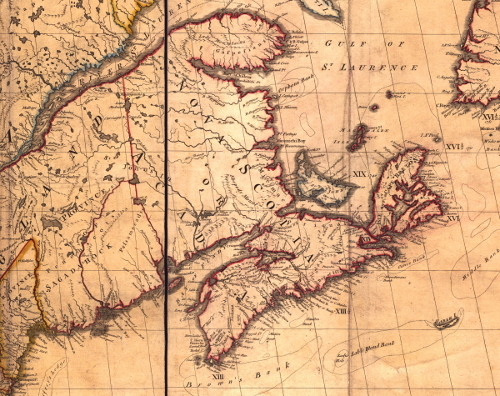 It clearly identifies Acadia as covering both today's New Brunswick and Nova Scotia territories. Prince Edward Island wasn't named at this time. During the 1979 Chapter-General in Halifax, it was suggested at that time that the Commanderies should have their own banners. Chev. Robert Pichette, KCLJ, then the Chancellor of the Acadia Commandery, took on the task of designing the banner and prepared a number of sketches. 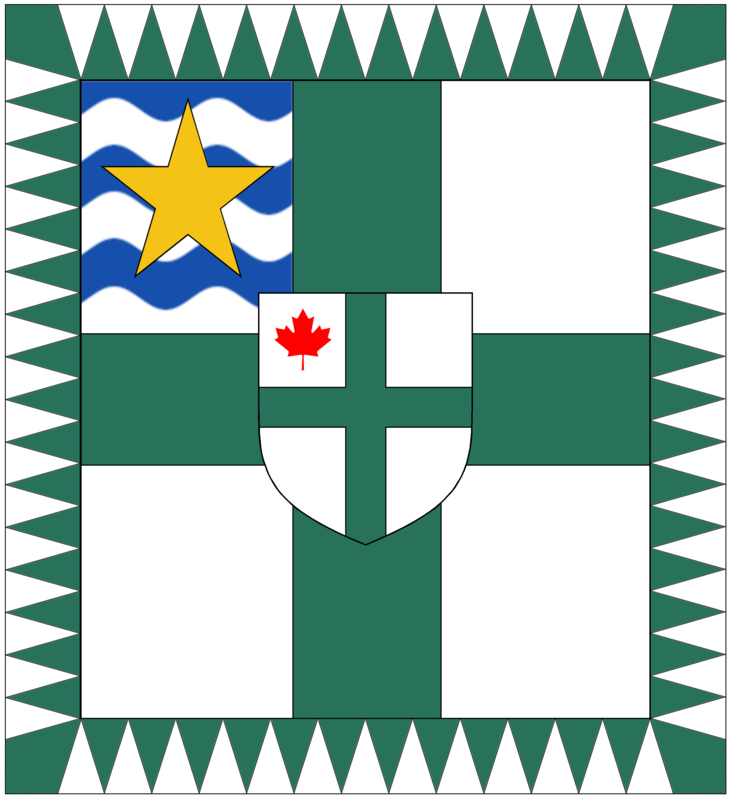 It was decided that all Commandery banners would to bear the green (Vert) cross of the Order on a white (Argent) field, with an escutcheon of the arms of the Grant Priory in Canada. In the canton (top left quadrant of the cross), some sort of symbolism representing their respective Commandery would be inserted. For Acadia, this emblem was comprised of six wavy bars, blue (Azure) and white (Argent) representing the ocean around the Maritime provinces constituting the Acadia Commandery. Superimposed on the wavy bars was the gold star, the ancient symbol of the Acadians referring to the Virgin, Stella Maris, or the "Star of the Sea". The banner was dedicated on October 16, 1982 during a service in the Edwin Jacob Memorial Chapel on the University of New Brunswick campus in Fredericton. From the outset, the Acadia Commandery has been involved in assisting and facilitating ecumenical activities, particularly via the Atlantic School of Theology, Halifax. The contributions by the Commandery also focused on medical-oriented activities, beginning with modest donations from 1975 - 1981. In 1982, it was decided that the charitable efforts would be concentrated on the giving of financial aid to the Peruvian leper colony of San Pablo. This continued until 1995 where the focus shifted once again towards charitable donations in the field of palliative care and continues with this focus today. Chevalier Brian T. Newbold, KCLJ, GOMLJ, D.Sc. "The History of the Acadia Commandery". Self published on behalf of the Acadia Commandery, 2004. The history of the Acadia Commandery was researched and compiled by Newbold, and the Acadia Commandery thanks him for this most detailed examination and research on its history. The Mitchell Map has been described, and rightly so, as the most important map in North American history. The most comprehensive map of North America produced during the Colonial Era, it represented the various territorial claims made by not only the competing British and French empires but also by the various British colonies. It has accordingly served, as recently as 1932, in legal disputes between eastern states. More importantly, it was the map on which the boundaries of the new United States were defined by American and British negotiators in Paris in 1782-83; in that capacity, it has continued to be of importance right up to the 1980s US-Canadian dispute over the Gulf of Maine fisheries. Osher Map Library, The Mitchell Map, last accessed: November 14, 2015. Founding Members: John Dickey, Patrick Duncan, Hugh J. Flemming, Most Rev. James Hayes, John Keith, Ian MacDonald, William MacLeod, John MacPherson, Bruce S. Oland, Desmond Piers, Stuart Smith, Della Stanley, George Stanley and Ruth Stanley. News, Grant Priory in Canada, OSLJ, Vol. 3, No. 1, April, pp6 (1982).